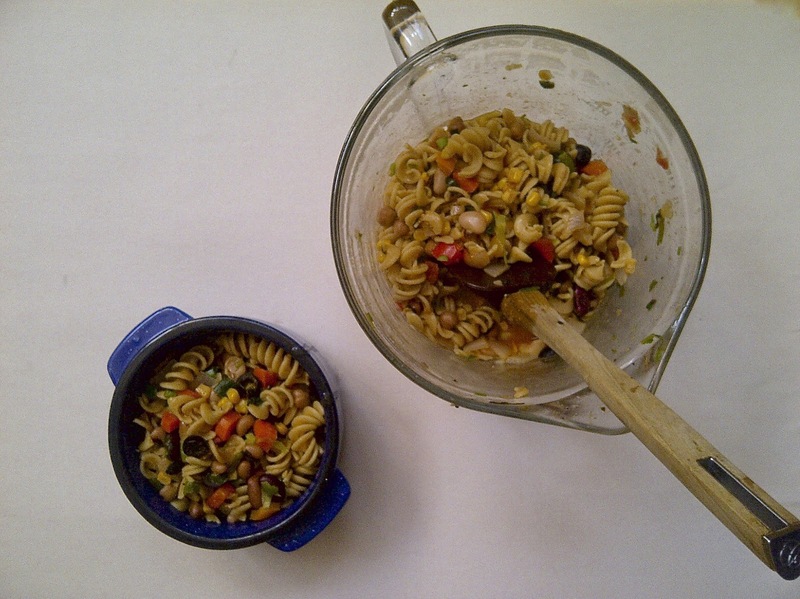 I didn't quite know what to call this...I went with 'Confetti Pasta & Beans'. 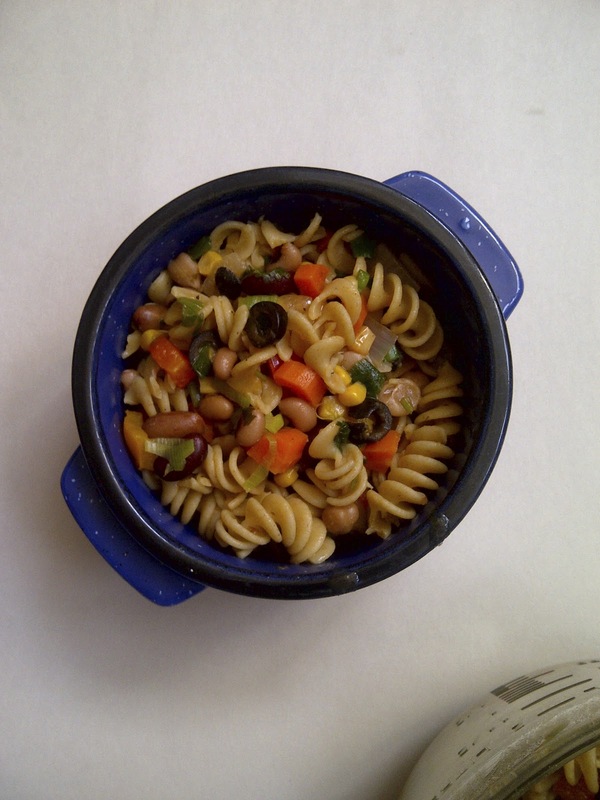 It just sounded better than 'Refrigerator Haul-In-A-Bowl, with pasta and beans'....or, 'Roy G. Biv pasta and beans'. Seeing how I represented every color in the rainbow, except blue, I opted to serve this in a pretty blue bowl. You remember ROY G. BIV...the acronym used to memorize the order of colors in a rainbow? Although it would have been a good description of this dish, I associate Roy G Biv as being a person - middle-aged, married, 2 kids, Laberdoodle, etc., not as dinner. Let's just humor Mr. Biv, shall we? **Update** I am a moron....ROY G. BIV....V='s Violet, not Purple....whoopsie!!!! I took this rainbow veg medley - tossed it with some whole wheat rotini pasta and a can of 6-bean medley (which is like a bean party-in-a-can: chickpeas, dark red kidney beans, black-eyed peas, white kidney beans, romano beans, baby lima beans). .....or a nice ol' glob of guacamole....or both? 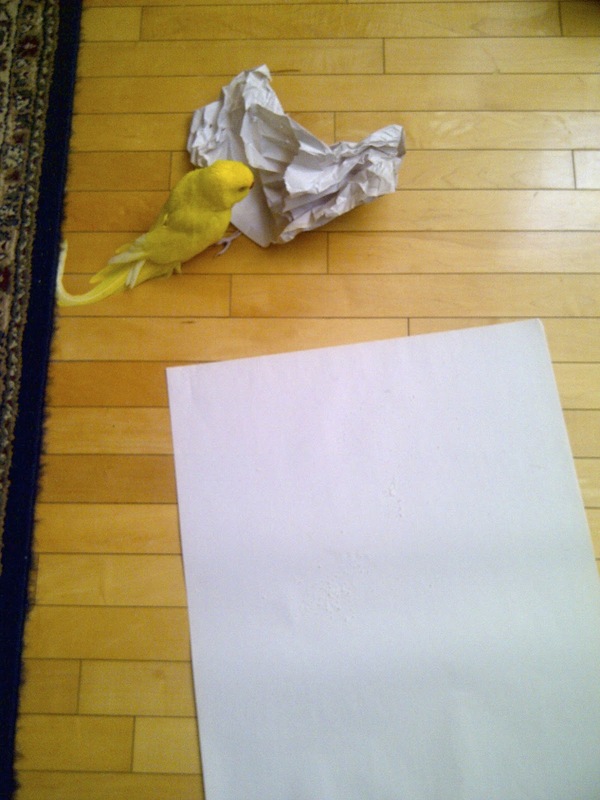 In closing I'll show how Big Bird stole my large sheets of paper I used as my background for these photos....she's sneaky!! 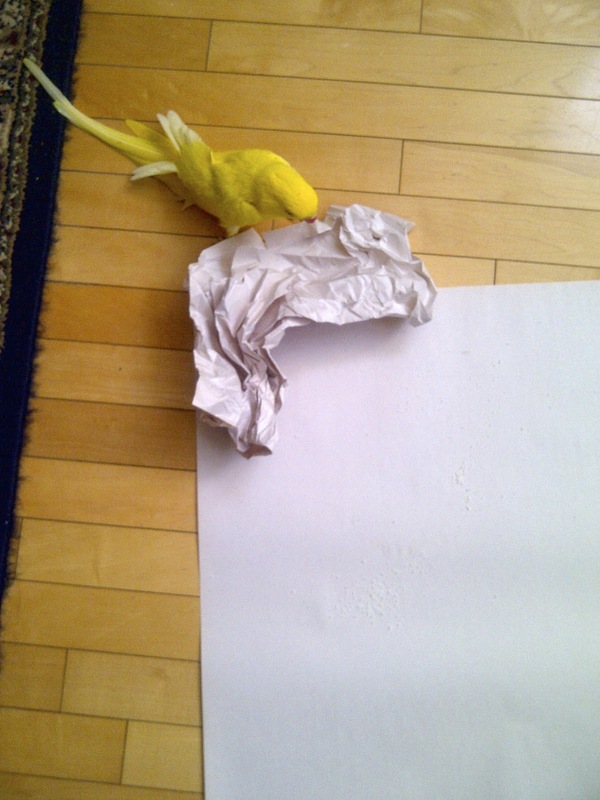 She hid out with her prize, under the table, happily shredding and mocking me with her laugh. 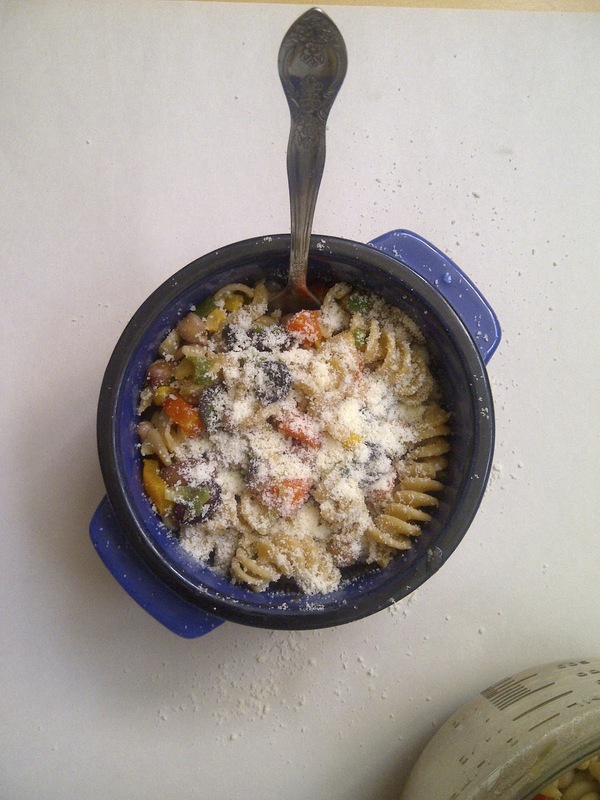 In a large pot, cook pasta to manufacturer's instructions. While the pasta is cooking, heat a large saute pan over medium-high heat, add bell pepper, onion, and carrots with a pinch each of salt and pepper. Cook for 4-5 minutes until onions are translucent, add minced garlic, cook for an additional minute. Add chicken stock, bring to a boil, reduce heat to a simmer, cooking until carrots are tender. Add cooked, drained pasta, and drained beans into the saute pan, stir to coat. Simmer on low for several minutes until liquids have been absorbed by the pasta - about 4-5 minutes. Remove from heat, stir in corn, scallions, cilantro, olives and tomatoes. 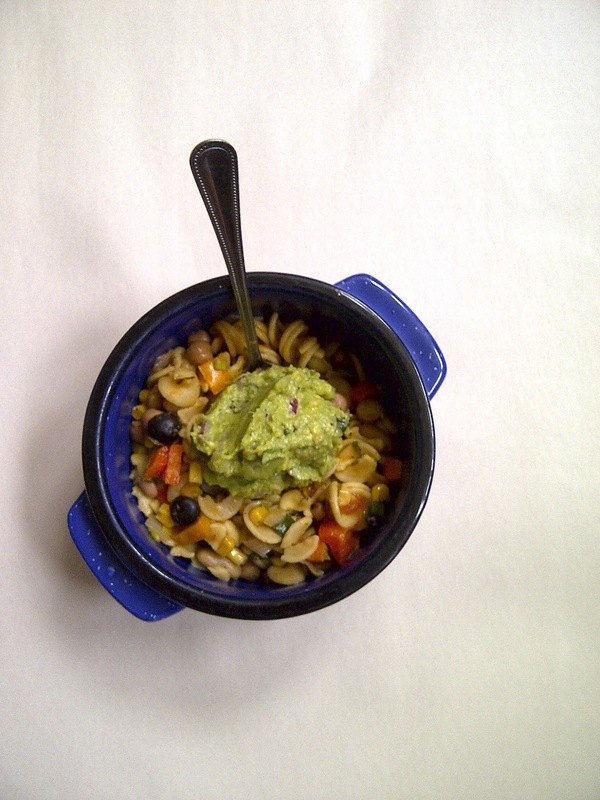 Top with grated cheese, or guacamole. Love the recipe and the crazy bird. My the cat seems awfully good with her? Thanks for sharing this on foodie friday. Diane ~ Those two have coexisted for 16 years....other than the cat thinking BB's tail is his own personal feather toy, all is good. Why don't I at age 57 know about the acronym for the colors in the rainbow?? Yes, you can teach an old dog new tricks!! Your rainbow dish looks so yummy--plenty of texture, color and flavor. That's what I like. Cindy ~ I don't know much, but I do know ROY G. BIV...and much other useless trivia....thanks for stopping by!! Wonderful recipe. It looks so colourful. 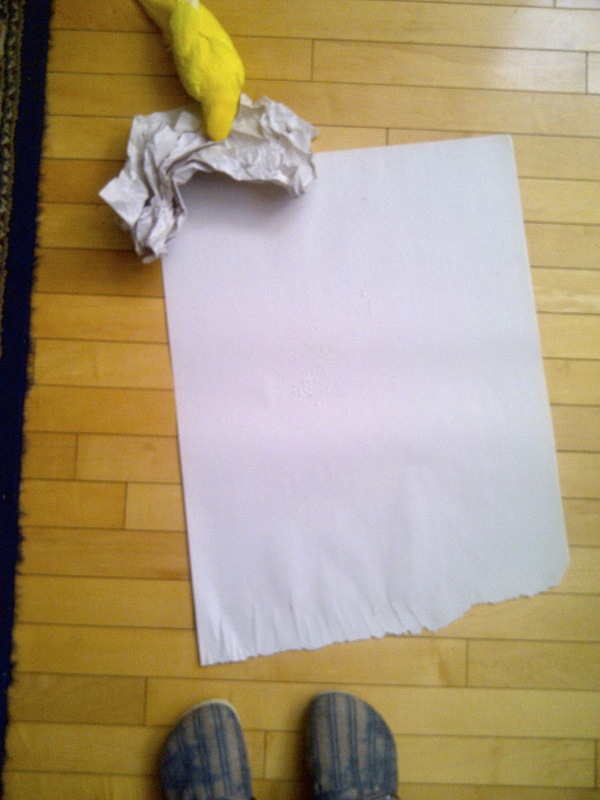 Your pet bird is beautiful! Thanks, Judy; she is a handful! Looks very good!! I like your little bird! Thanks! We've had her for 19 years...she still keeps us on our toes!! What a crazy bird! If she was smart she would have went for the yummy pasta and not the paper. Thank you for sharing on Fluster's Creative Muster Party! Isn't it funny how some thing stay with you? Thanks for stopping by, I will check out your party!